City manager Wally Bobkiewicz at a meeting. Aldermen on Monday will discuss the proposed fiscal year 2019 budget. Aldermen on Monday will discuss the city’s proposed fiscal year 2019 budget, which has garnered concerns from both residents and council members. The proposed budget sets to fill an estimated $7.4 million deficit, which is a combination of three things: a $4.9 million general fund shortfall, a $1.5 million replenishment of recently depleted reserve funds, and plans for the new Robert Crown Community Center, which will require an extra $1 million for debt service on borrowed money. However, Friends of the Robert Crown Center, a nonprofit organization that is raising money for the new center’s construction, said they can provide the city with an additional $1 million in funding for the project. Peter Giangreco, the group’s secretary, said the organization has raised more money this year than originally anticipated, and may now be able to fill the gap. He said its board voted unanimously to give the additional money to the city. In a letter sent to Mayor Steve Hagerty and members of City Council, the organization’s board said they have already raised $11.7 million of their $15 million “stretch” fundraising goal. At a February City Council meeting, aldermen decided that Friends of the Robert Crown Center had to provide the city $2.5 million toward construction costs in fall 2018. But according to the letter, the group is able to give $3.5 million — $1 million more than expected. Giangreco said since the package passed, the project has experienced $4.5 million in construction overruns. City manager Wally Bobkiewicz said on Oct. 12 that his office received the proposal and sent it to the city’s legal and financial departments for review. To solve the deficit, Bobkiewicz said staff is suggesting decreasing expenditures by an additional $4.3 million and increasing revenue by $3.3 million. Included in these proposed cuts are plans to shut down Evanston Fire Department Station 4, cease city operation of Gibbs-Morrison Cultural Center and restructure and reduce funding to certain services in the Health and Human Services Department. The proposed budget also calls for a number of staff reductions of both vacant and filled positions. Residents and aldermen alike have expressed their concerns with those cuts. The proposed closure of Station 4 has been met with backlash. The station — located at 1817 Washington St. — is in the 2nd Ward and services the southwest region of Evanston. Bobkiewicz said if City Council approves the proposed budget, the building that houses Station 4 will be sold and nearby stations will take over emergency services for the area. Slower response times are a major concern for residents, especially in a city the size of Evanston. Currently, there are five fire stations, but the closest is a mile away from Station 4. However, in an email to The Daily, Evanston Fire Local 742 Union executive board members Ryan Roeder and Billy Lynch said “recklessly” closing Station 4 would cause delays in service and thereby compromise safety. 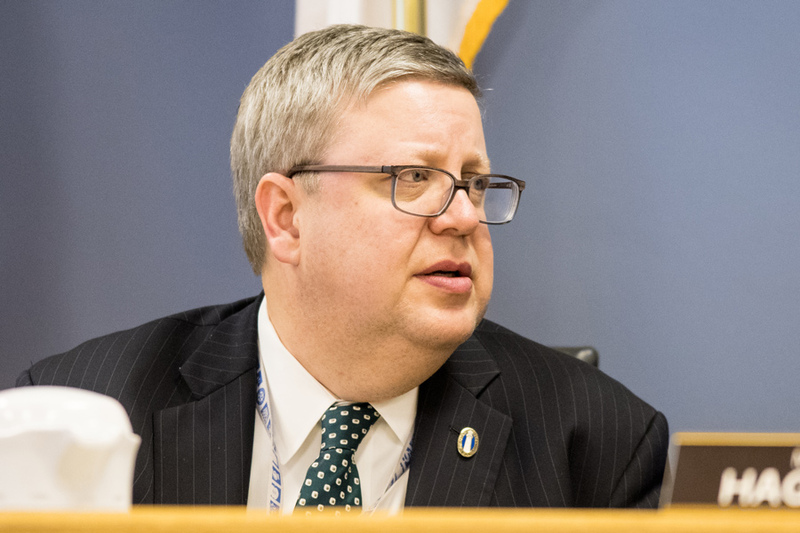 Additionally, proposed restructuring of Evanston’s Health and Human Services Department could put the unit’s status as a health department at risk. The budget proposal recommends the elimination of several positions within the department, including the communicable disease surveillance specialist. Illinois state law requires the position to be filled for the department to be considered a recognized health department. Ald. Tom Suffredin (6th) shared concerns about potential layoffs and department restructuring. On Oct. 15, he said he is confident aldermen will pass a budget at the end of the year, but said it’s unlikely that everyone will be happy with every part of the document. “It’s going to be a balanced budget and no one is going to be thrilled about it,” he said.